The Cyprus carnivals are over and Lent is underway – a 40 day fasting period of no meat, poultry or dairy products. The hundreds of bakeries accommodate those who fast by adding dairy-free, egg-free and meat-free pastries and cookies to their already vast array of goodies. Generally, fasting is followed more strictly in the villages of Cyprus than in the towns, but most restaurants and takeaways also add fasting dishes to their menus during this period. 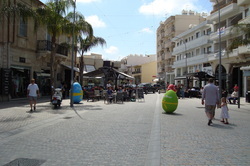 Easter is the most important religious holiday in the Greek Orthodox Church. The date of Greek Orthodox Easter is based on a modified Julian calendar. In 2014 Greek Orthodox Easter will coincide with Easter in the Western Churches which use a different calendar, the Gregorian. The date this year is April 20th. Thursday of Holy Week is when the wonderful aromas begin to waft out onto the streets as this is traditionally the day when housewives start preparing the flaounes (small loaves made of flour, eggs, cheese, mint and sometimes raisins). These are shaped into triangles, sprinkled with sesame seeds then baked in the oven. Tiropites (small cheese pies in puff pastry), paskies (small meat pies) and koulouria (biscuits made of milk, flour, spices and sugar) are also prepared. Eggs are hard boiled and dyed red in preparation for games on Sunday. Everywhere is a hive of activity.